Bamboo is one of the most versatile plants in the world, providing raw material for almost everything you can imagine; building supplies, transportation, clothing, furniture, accessories, kitchen utensils, surfboards and many more uses. And you can eat it too. 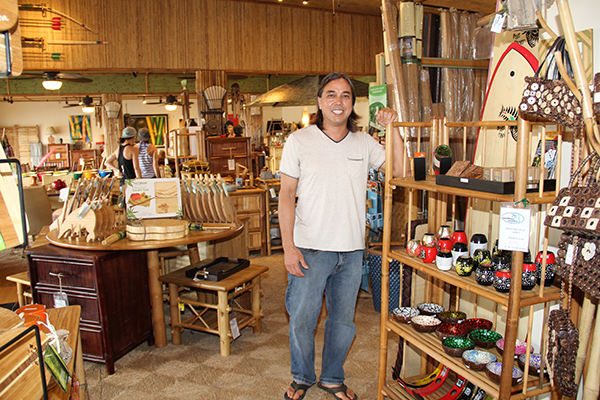 Bamboo Works, in the heart of Old Kapa‘a Town, has been serving Kaua‘i for more than 14 years, offering a wide array of bamboo products. “Our specialty is bamboo, and then we also carry a mix of other products made from natural, recycled products,” said Bamboo Works owner Julian Ruppert, adding bamboo is one of the most eco-friendly materials available. Unlike wood, which is harvested from trees that may take 40 years or more to grow, and then have to be replanted, bamboo has a high renewability. Bamboo takes three to five years to reach maturity, and then it’s harvested every year without the need to be replanted because new shoots come out annually. Bamboo is also more efficient than trees of the same size as sequesters of carbon dioxide, a major greenhouse gas culprit of global warming. And bamboo’s strength is not bad either. “It’s super strong, its strength-to-weigh ratio is harder than steel,” Julian said. With more than 1,500 species of bamboo available, different plants have different uses. 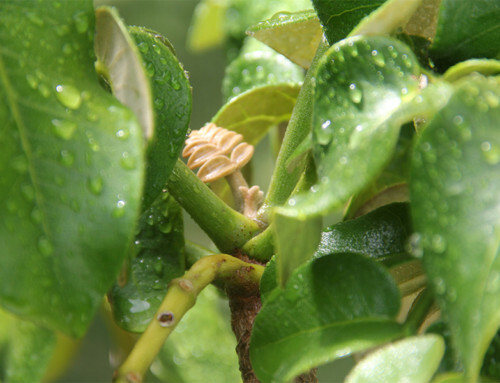 Some are used for weaving, others for clothing, construction, food, and the list goes on. 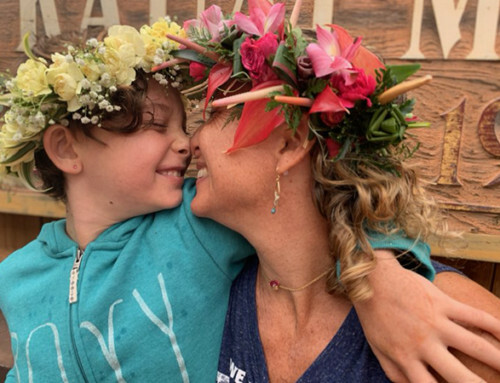 “I have 30 species of bamboo growing on my property right now that I’m kinda doing a test of different species to see what grows good in Hawai‘i,” said Julian, adding the majority of them are for construction, but half of them can be eaten as young shoots. 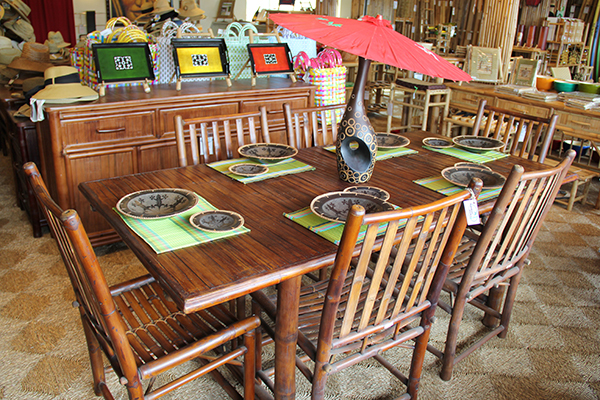 Most of the products offered at Bamboo Works come from trade shows and from Southeast Asia. But Julian also can help design custom furniture for his clients. 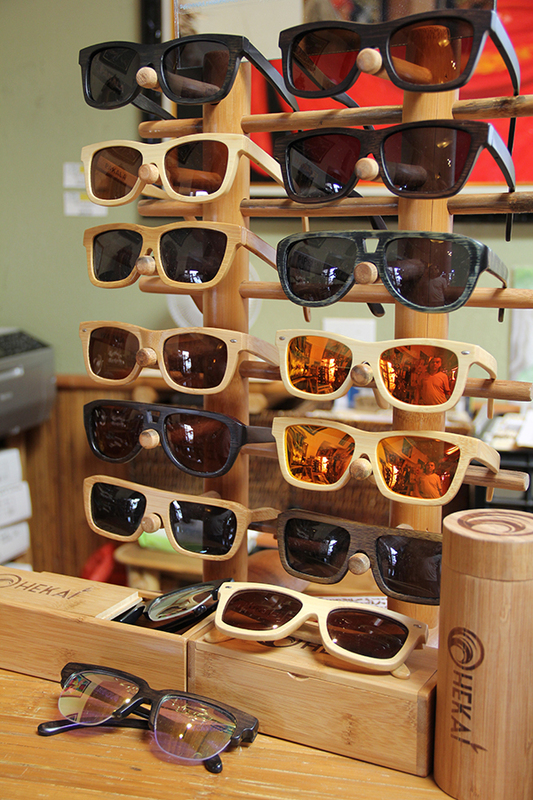 This year, he launched his own line of bamboo sunglasses and watches, called Ohekai (bamboo and ocean in Hawaiian language) and they quickly became some of the store’s best selling items. “I like to keep things fun, create new things,” he said. Julian’s relationship with bamboo goes back 20 years, and it happened by chance. Back in 1995, while living on Maui, a neighbor asked Julian if he wanted some bamboo from Thailand that one of his tenants left behind. Julian took the bamboo and built a gazebo. Then he got introduced to some architects who were doing homes with bamboo, and soon he was building helping them to build those homes. When Julian returned to Maui after a stint on the Mainland, his new landlord just happened to be starting a bamboo flooring company. “Somehow bamboo kept popping out in different instances,” he said. So he decided to make a career out of bamboo. In the fall of 2001, Julian opened Bamboo Works in a space behind the dragon building in Kapa‘a, selling mostly construction materials, especially flooring. 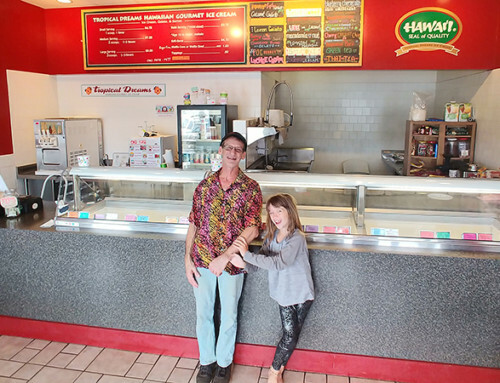 After the 2008 economy crash, he opened a small storefront in Kapa‘a, and for a while he was running two locations. The original one was selling mostly construction, and the new one had smaller items and some furniture. 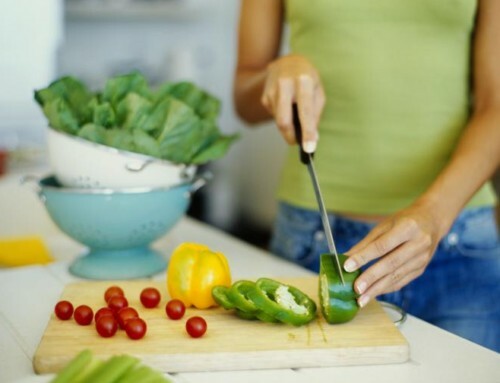 When the newer location had an opportunity to expand, he closed the first one and put his energy into one place. Then in November of 2014, Julian bought a larger retail space just a couple doors from where he was operating. 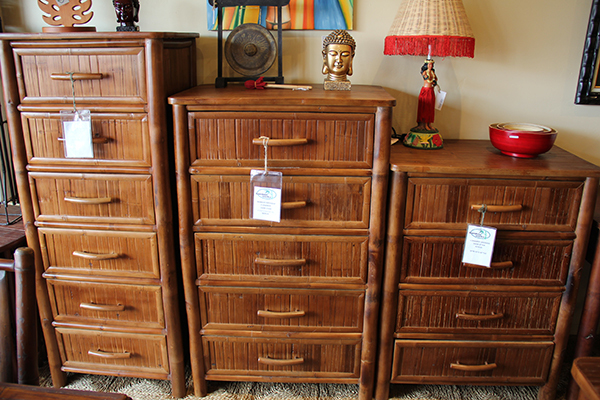 Last January, Bamboo Works opened the doors of its newest and larger retail space. 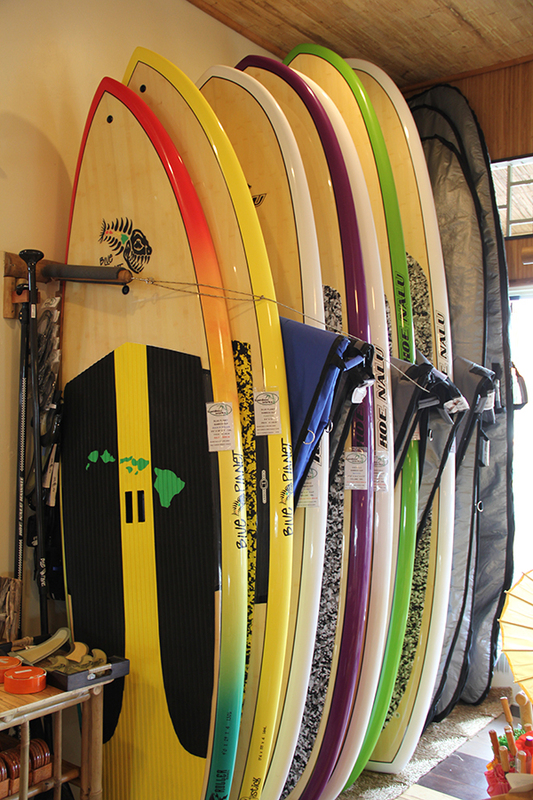 They now offer surfboards, bicycles, clothing, furniture, construction materials, house décor, personal items and a lot more. “We got a huge array of goods,” he said. In about a year, he wants to offer smaller bamboo structures, and has already done some design work with the help of an architect. 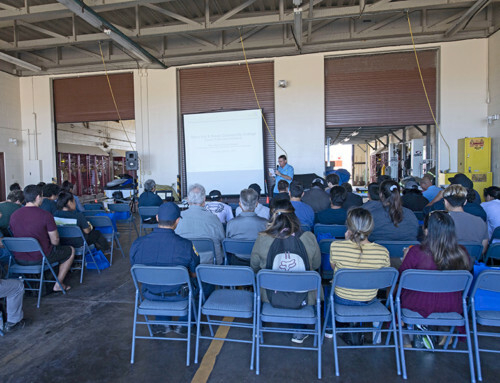 The plans include outside covered showers, carports, lanais, gazebos and other small structures. Bamboo Works is at 4-1388 Kuhio Hwy #C-109, just south of Kapa‘a Beach Park. They are open from 10 a.m. to 6 p.m. Monday to Saturday, and on Sunday they are open from 11 a.m. to 4 p.m. 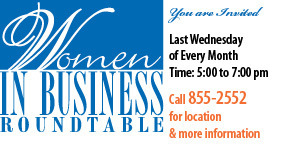 Call 821-8688 or visit www.bambooworks.com for more information.